Dental implants are a great solution for anyone looking for a permanent replacement to missing teeth or damaged teeth. Compared to other dental appliances like dentures and bridges, dental implants in Jenkintown are an effective long-term solution. Because dental implants look, feel, and function like natural teeth, they are becoming a popular solution in restorative dentistry. 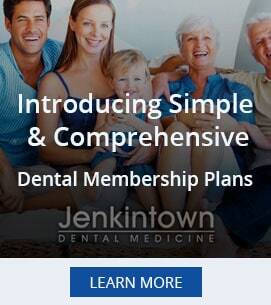 What Are Jenkintown Dental Implants? Jenkintown veneers are custom made for your smile. They are made of thin shells of ceramic that are bonded to the front of your teeth to improve strength, durability, and overall aesthetics. They can provide a comprehensive remedy to a variety of cosmetic dental problems giving you the clean, bright, healthy looking smile you’ve always wanted. That is why it is extremely important to have an experienced cosmetic dentist in Jenkintown, PA provide you with the advanced dental care that you need. Depending on your case it is possible to replace one missing tooth, a set of teeth, or even your entire set of upper or lower teeth. To be the right candidate for this procedure it is important to know what is involved. Make sure to see your dental implant specialists in Jenkintown for a free consultation. If you have missing teeth and you choose to ignore fixing the problem it can have devastating effects. Your jawbone can actually shrink over time and change the appearance of your face. Missing teeth can change your jawline causing your teeth to shift and leave your facial structure looking sunken in or distraught. Not addressing the problem will also lead to problems such as chewing food and speech. That is why it is so important to see a Jenkintown dental implant specialist to help restore your smile and give you back the confidence you need. Everyone knows that having a great smile not only boosts your confidence, but also is a sign of good overall health. Catherine West D.M.D., Brian Wilk D.M.D., and our team of cosmetic dentists in Jenkintown are committed to providing you with the healthy, beautiful smile you have always dreamed of. We take pride in offering the latest advancements in cosmetic dentistry including dental implants to brighten, enhance, repair and straighten your teeth. We also provide the following dental services: Invisalign clear braces, pediatric dentistry, cosmetic dentistry, emergency dentistry, dental implants, fillings/restorations, dentures, bridges, dental crowns, tooth extractions, root canals, bonding porcelain veneers, inlays and onlays, and teeth whitening. Proudly serving Jenkintown PA, Abington PA, Elkins Park PA, Cheltenham PA, Glenside PA, Willow Grove PA, Wyncote and surrounding areas.